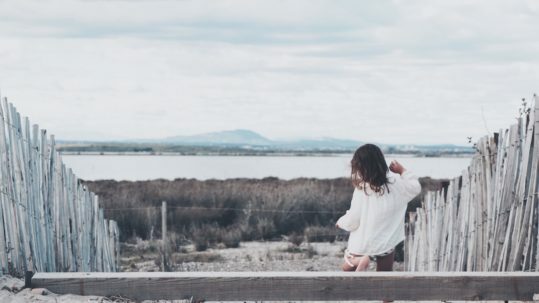 I would like to think that there are moments that can make time stand still. When everything around you seems to stop but your mind keeps racing. You’re trying to find a way to categorize the moment, to remember it all. Hoping that it will change you, if only slightly. Enough to when you think back on this moment, you will remember this place and these feelings. I still don’t think there are words to describe these types of moments; when the world is so sublime. Maybe there aren’t supposed to be. Perhaps forcing these moments into words would be restricting all of these thoughts and feelings to 26 letters. Maybe it is meant to stay an indescribable feeling and to label it too much would strip it of it’s wonder and awe. Maybe we need moments in life that are bigger than us and our vocabulary. Do you ever have those moments? When you are looking out at life and you are forced to pause for a second. When you try desperately to take it all in. Trying to remember every little detail, every little feeling. But it’s impossible. You try to retell the story or describe the situation in your head, but you can’t quite put it into words. We had a thin blue mat, a musty sleeping bag, and a small brick of foam for a pillow. We laid out our supplies and laughed at our sleeping conditions. We weren’t surprised, we knew exactly what we signed up for. Though we ended up sleeping only a few hours that night, I wouldn’t have changed a thing about it. 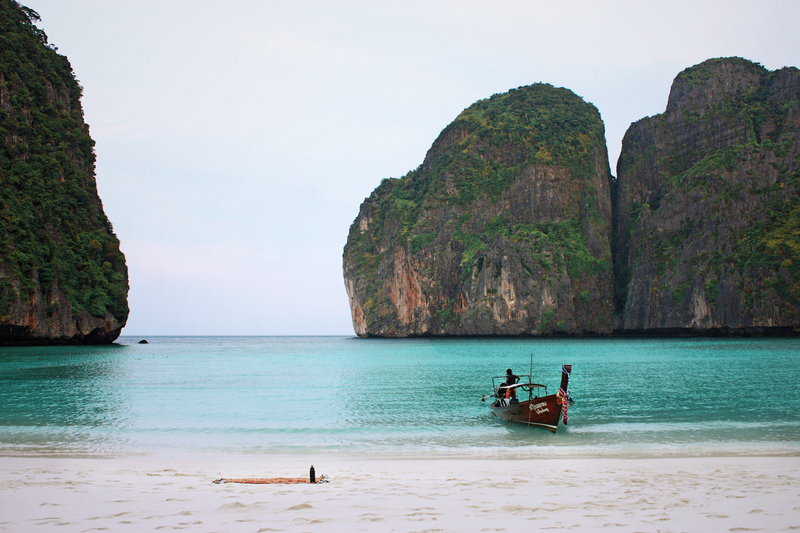 We embarked on the Maya Bay Sleep Aboard tour in Koh Phi Phi, Thailand. 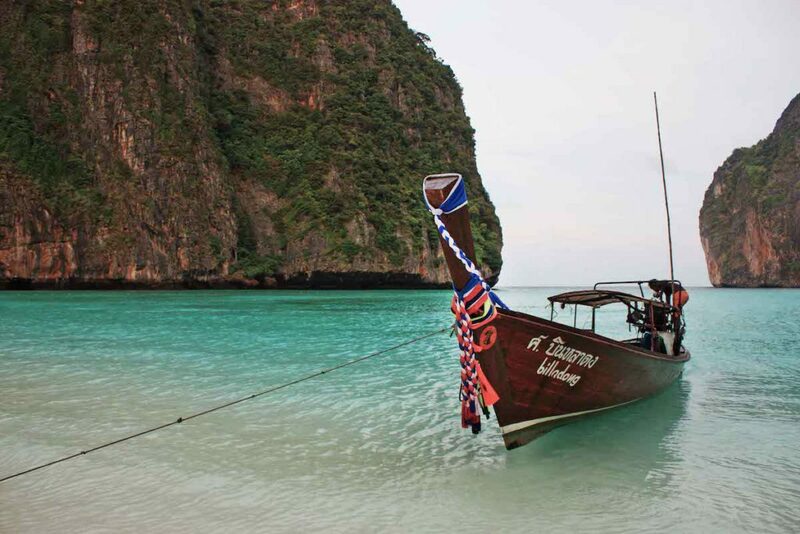 We would take a private boat over to the famous island of Koh Phi Phi Le, where Leonard DiCaprio’s The Beach was filmed. Regulations on this protected area meant it was illegal to sleep here or even be on the island after nightfall. One local man was lucky enough to source a permit that allowed him to take a boat of 20-or-so tourists out to Maya Bay each day. They spend the afternoon and evening on the island, then retreat to the boat and sleep in the bay at night. The day started with a gentle cruise around the lush and breathtaking island. 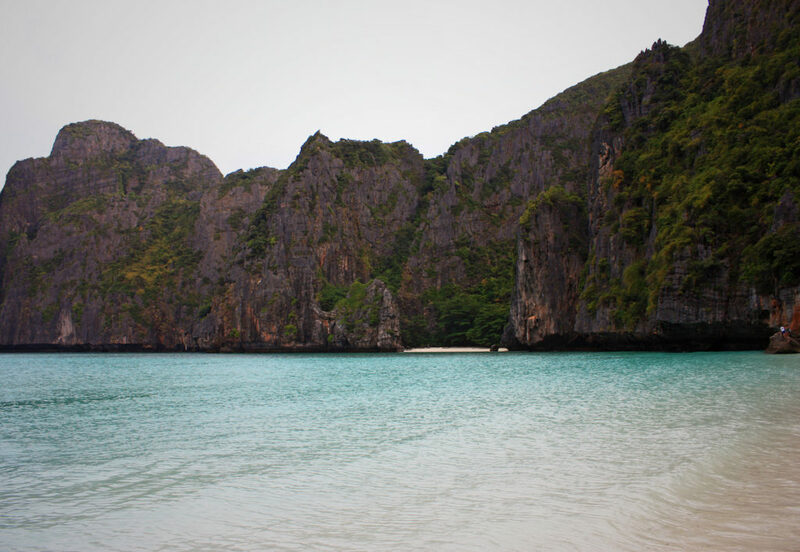 We gawked at jagged caves and jewel-toned bays. We jumped from the roof of the boat into crystal clear waters, kayaked around a hidden cove, snorkeled through walls of brightly colored fish, had a private BBQ on the beach after sunset, and eventually stuffed into a traditional long tail boat and taken back to our anchored vessel at the edge of the bay. There were about 18 of us on the boat that night, all from various corners of the world; Brazil, Germany, Australia, Canada. A few travelers sat downstairs comparing stories and itineraries. Another group sat with their feet dangling off the back of the boat taking turns playing guitar and finding songs that transcended the language barriers. A few adventurous individuals dove into the midnight water and swam with the fluorescent blue plankton. As our boat gently swayed back and forth beneath the moon and starlight, we could see the walls of our cove stretching tall around us. In one direction, sand was illuminated by the moonlight and waves broke gently on the shore. In the other direction, water as far as you could see. Everywhere in-between was filled with giant limestone crags that shot up into the sky and danced around us as our boat slowly turned with the waves. We had laid out our mat and sleeping bag on the roof of the boat. Lying there in silence under the shimmering night sky, I remember visualizing where we were on a map. I remember placing a proverbial pin in this tiny little bay that was a 40 minute sail from the main island, that was a few hours from the coast of Thailand, which was dangling at the tip of South East Asia, that was on the opposite side of the map from the United States. Here I was, on this teeny tiny island, sleeping on the roof of a boat, watching the most brilliant display of mother nature play out around me. I remember thinking of ways to describe that moment to people; to describe the entire day: the absurd amount of fish, the sapphire blue water, the rugged island cliffs, sitting in the sand eating curry at sunset. It would be impossible to remember it all. Pictures wouldn’t capture the feelings. Words wouldn’t capture the smell of the ocean or the overwhelming sense of being alone on a foreign island, thousands of miles from anyone you know. 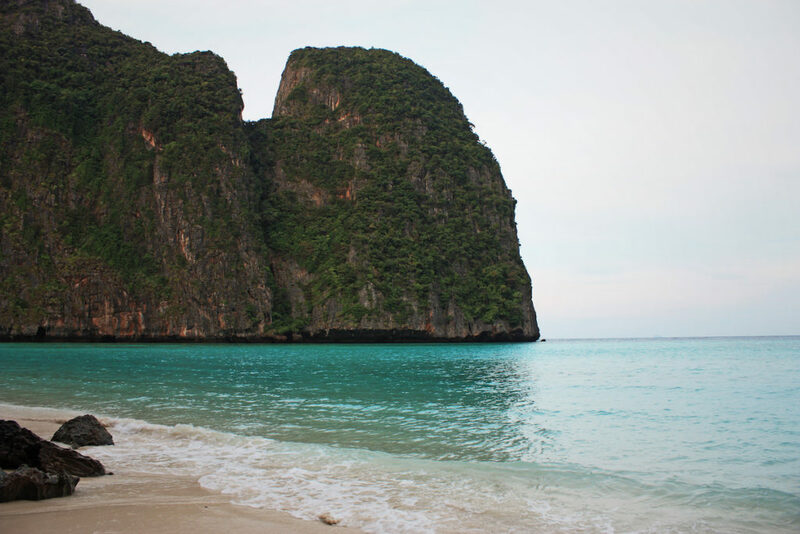 For a few beautiful, moon-lit hours Maya Bay was all ours.